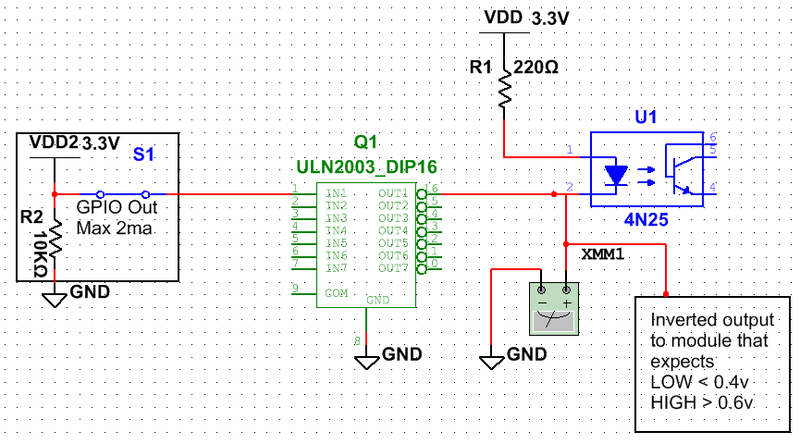 I'm busy designed a PCB that will use a Raspberry Pi's GPIOs to to drive several optoisolators. Additionally I'm also interfacing with an IO module that works with HIGH > 1V. Because of the number of optoisolators I'm using I don't want to overload the Pi's GPIO's and planned on using a ULN2003 to do the heavy lifting and drive the opto's. Additionally, I would like to use the inverted output of the ULN2003 to drive the aforementioned IO module. My knowledge is mostly in digital systems, so the only place I have used the ULN2003 before was to drive some LEDs from GPIOs. Keep in mind that you will have a voltage drop of about 0.9v-1.0v over the UL2003 when in circuit. I'm a little bit lost here. I've drawn up a schematic to help. All GND's are common. Does this saturation voltage mean that XMM1 will measure about 1V when the input is high? Multisim doesn't want to simulate the ULN. I found a Toshiba component that looks identical to the ULN2003 but uses DMOS (I assume this is closer to N-channel mosfets, which I'm more familiar with). The Toshiba TBD62003 (datasheet) which is also slightly cheaper than the ULN2003. Can anyone tell me if it can be used as a drop in replacement for the ULN2003 in the schematic above. (Just hook up the GND pin, load's negative side connected to OUT1 and GPIO drives IN1)? By the looks "equivalent circuit" it uses a n-type mosfet? EDIT: I found a very useful application note by Toshiba which shows that is pretty much a drop-in replacement. While Michael Karas' answer is correct, it does not simply answer your questions, so I will. That's exactly correct. The saturation voltage is simply the voltage across the output when it is fully turned on. You'll notice that it increases with increasing load current. 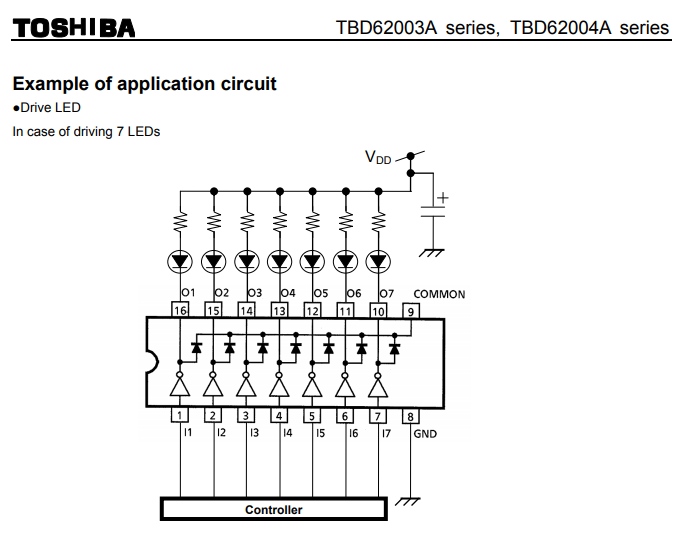 I found a Toshiba component that looks identical to the ULN2003 but uses DMOS (I assume this is closer to N-channel mosfets, which I'm more familiar with). The Toshiba TBD62003 (datasheet) which is also slightly cheaper than the ULN2003. Can anyone tell me if it can be used as a drop in replacement for the ULN2003 in the schematic above. (Just hook up the GND pin, load's negative side connected to OUT1 and GPIO drives IN1)? Again, you're correct. And you'll find that the saturation voltage for the Toshiba part is generally lower than for the ULN, at least for lower currents, like 100 mA. This will let the part run cooler. At higher currents, about 350 mA, the two are comparable in voltage drop. You should surely be able to use the DiMos part in place of the ULN2003 in the application you have shown. The big advantage of the DiMos part is that when the output FET turns on it will pull the output much closer to GND than the ULN2003. The transistor drivers in the ULN2003 are configured as Darlington pairs of NPN transistors to get high gain. Unfortunately there is a price to be paid for that configuration in that the output transistor can never fully saturate and will end up having that voltage drop of about a volt. Not the answer you're looking for? Browse other questions tagged transistors raspberry-pi gpio uln2003 or ask your own question.